The FTC has an important announcement: your smartphone cannot cure acne. Today's mobile devices are so much more than just phones. You can play games on them, listen to music, surf the internet, snap high-quality photos and send them around the world and do countless other things. But one thing they cannot do, I'm sorry to say, is clear up your acne. 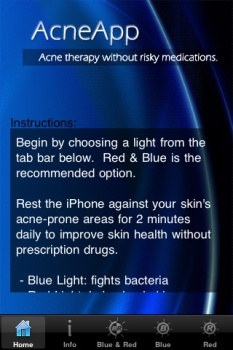 So declared the FTC, which recently proposed a settlement of complaints against the developers responsible for two mobile applications, Acne Pwner and AcneApp, which claimed that colored lights emitted from a mobile's screen, applied to affected areas for a few minutes each day, could significantly reduce blemishes and bacteria that causes acne. AcneApp was actually developed in conjunction with a dermatologist, Houston-based Dr. Gregory Pearson, and claimed that "a study published by the British Journal of Dermatology showed blue and red light treatments eliminated p-acne bacteria (a major cause of acne) and reduces skin blemishes by 76 percent." But the FTC ruled that Pearson and AcneApp developer Koby Brown misrepresented the study, noting that while light therapy can help treat acne, the levels of light emitted by phone screens are too low to have any effect. "Smartphones make our lives easier in countless ways, but unfortunately when it comes to curing acne, there's no app for that," FTC Chairman Jon Leibowitz said in a statement. The whole thing sounds silly but a fair amount of money was spent on the two products. Roughly 3300 people bought Acne Pwner from the Android Marketplace for 99 cents, while 11,600 people dropped $1.99 at the App Store for AcneApp. Under the terms of the proposed settlements, Pearson and Brown will have to pay $14,294 and and Acne Pwner creator Andrew Finkle will have to pay $1700 to resolve the complaints, and they'll also be legally banned from "making safety and performance claims about any device without reliable scientific evidence."